Exploring Coevolutionary History: Do Entire Communities Shape the Evolution of Individual Species? Interactions between plants and pollinators tend to be highly generalized. In 1980, Janzen published an article titled “When is it coevolution?” where he explained the concept of diffuse coevolution: the idea that evolution of interacting species is shaped by entire communities, rather than simple paired interactions. This idea, though compelling, remains poorly understood, and strong evidence of diffuse coevolution acting on a community is lacking. Perhaps this is because there’s a lack of consensus on what would constitute evidence in support of the concept of diffuse coevolution, or, indeed, coevolution in general (Nuismer et al 2010). b) traditional methods are designed to evaluate pairwise interactions, not generalist species with many interactions. A Kenyan sunbird disobeying the classical pollinator syndrome. A classic example of a large community with many generalized interactors is plants and pollinators. 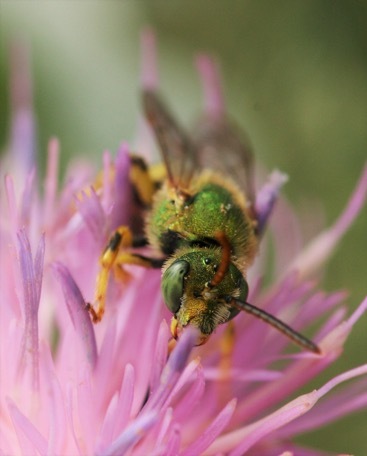 Although plant-pollinator interactions are the textbook example of coevolution, there’s little quantitative evidence that coevolutionary forces are actually shaping these interactions at the community level. Few flowering species even conform to our classical concept of pollinator syndromes. In addition, tight, specialized interactions are the exception rather than the rule in plant-pollinator interactions; despite the fact that these classic examples (including Darwin’s moth) are often what we think of when discussing coevolved plant-pollinator mutualisms. So, the challenge becomes: how can we test for signals of coevolution when interactions are diffuse, acting weakly, jointly, and severally on all interactors? In 2014, Althoff et al. published a useful framework for exploring evolutionary patterns, distinguishing coevolution from other possible processes in communities of interacting species with concordant phylogenies. In their paper, they explain that testing signals of coevolution requires multiple, complementary analyses. These multiple analyses should be able to distinguish between signals of coevolution and alternate evolutionary processes that could lead to similar patterns: vicariance and phylogenetic tracking. It can use taxonomic data in place of phylogenetic data, where phylogenetic data are sparse. It can handle polytomies in the taxonomic data where dichotomous relationships cannot be resolved. It can handle generalist species with many interactions. It can be used across many taxonomic levels. First, our method uses a fourth corner analysis to reveal concordant taxonomic structures between interacting species. The fourth corner analysis was originally designed by Legendre et al (1997) to better understand the relationships between species traits and environmental characteristics of habitat types. Figure 1 from Russo et al, a heuristic diagram illustrating the fourth corner analysis. For interacting species with concordant taxonomic structures, we test these relationships with Mantel tests to determine whether the taxonomic structure is correlated with the interaction structure within each group. Between the fourth corner analysis and the Mantel tests, there are three tests run for each set of interacting species. One fourth corner test for taxonomic concordance, and one Mantel test for each group of interactors. This analysis lets us suggest one of the evolutionary processes suggested by Althoff et al (2014), and identify asymmetry in the correlations between taxonomic and interaction structure. This asymmetry in the strength of plant-pollinator interactions has also been found in other systems (e.g. Ramirez et al 2011). We use a large legacy dataset of plant-pollinator interactions as a case study to test our methodology because of its large spatial, temporal, and taxonomic scale. These interactions were observed by an independently wealthy naturalist, Charles Robertson, over the course of 33 years and across 225,000 hectares. To the best of our knowledge, it is the largest dataset of its kind, though our method could easily be applied to a larger dataset (if there is one). Prevalent patterns of asymmetry, where the taxonomy of insect visitors seemed to be more strongly influenced by their interactions with plants than vice versa. Many examples of vicariance and phylogenetic tracking, but no examples of diffuse coevolution (according to our stringent and conservative criteria). Patterns consistent with our traditional understanding of plant-pollinator interactions (e.g. stronger correlations in groups typically considered to be pollinators, such as bees and syrphid flies). Groups where the interaction seems to have little, if any, influence on the taxonomic structure of the interactors (i.e. coevolutionary patterns are contraindicated). Syrphids have an asymmetric interaction with asters in the Robertson dataset. We apply our method to evaluate evolutionary patterns in bipartite plant-pollinator community. However, it could also be applied to any set of species interactions, as long as the dataset is large enough and taxonomically diverse enough. When there is no taxonomic diversity to operate on, our method cannot provide any information (e.g. when all species are in the same genus or there is only one species per genus). Otherwise, it’s very flexible and can tolerate any taxonomic grouping assigned by the researcher, including taxonomic ranks, like tribes or varieties that are unevenly applied. This entry was posted in Evolution, Methods papers and tagged Bipartite Networks, Coevolution, community ecology, evolution, Evolutionary Patterns, Phylogenetic Tracking, Plant Pollinator Interactions, Plants, Pollinators, Vicariance by Chris Grieves. Bookmark the permalink.